SO OPENLY CORRUPT did the fallen church become in the Middle Ages, we can readily understand why in many places men rose up in protest. Many were those noble souls who rejected the false claims of the pope, looking instead to the lord Jesus for salvation and truth. These were called 'heretics' and were bitterly persecuted by the Roman Catholic church. The aforesaid Bull 'Ad exstirpanda' remained thence forth a fundamental document of the Inquisition, renewed or reinforced by several popes, Alexander IV (1254-1261), Clement IV (I265-1268), Nicholas IV (1288-1292) , Boniface VIII (1294-1303), and others. The civil authorities, therefore, were enjoined by the popes, under pain of excommunication to execute the legal sentences that condemned impenitent heretics to the stake. It is to be noted that excommunication itself was no trifle, for, if the person excommunicated did not free himself from the excommunication within a year, he was held by the legislation of that period to be a heretic, and incurred all the penalties that affected heresy. Men pondered long in those days on how they could devise methods that would produce the most torture and pain. One of the most popular methods was the use of the rack, a long table on which the accused was tied by the hands and feet, back down, and stretched by rope and windlass. This process dislocated joints and caused great pain. Heavy pinchers were used to tear out fingernails or were applied red-hot to sensitive parts of the body. Rollers with sharp knife blades and spikes were used, over which the heretics were rolled back and forth. There was the thumbscrew, an instrument made for disarticulating fingers and "Spanish boots" which were used to crush the legs and feet. 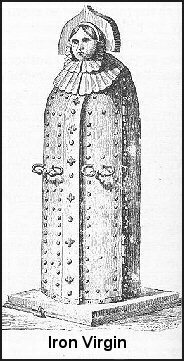 The "Iron Virgin'" was a hollow instrument the size and figure of a woman. Knives were arranged in such a way and under such pressure that the accused were lacerated in its deadly embrace. This torture device was sprayed with 'holy water' and inscribed with the Latin words meaning, 'Glory be only to God." Victims after being stripped of their clothing had their arms tied behind their backs with a hard cord. Weights were attached to their feet. The actions of a pulley suspended them in mid-air or dropped and raised them with a jerk, dislocating joints of the body. While such torture was being employed, priests holding up crosses would attempt to get the heretics to recant. Protestant persuasion, was apprehended and condemned to death by the sentence of Milan. At the place of execution, a monk presented a cross to him, to whom Gamba said, "My mind is so full of the real merits and goodness of Christ that I want not a piece of senseless stick to put me in mind of Him"' For this expression his tongue was bored through and he was afterward burned. Some who rejected the teachings of the Roman church had molten lead poured into their ears and mouths. Eyes were gouged out and others were cruelly beaten with whips. Some were forced to jump from cliffs onto long spikes fixed below, where, quivering from pain, they slowly died. Others were choked to death with mangled pieces of their own bodies, with urine, and excrement. 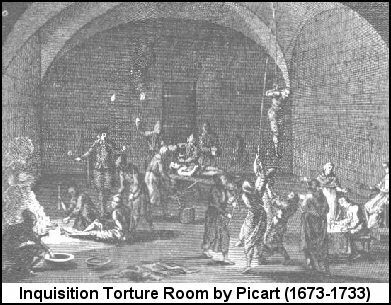 At night, the victims of the Inquisition were chained closely to the floor or wall where they were a helpless prey to the rats and vermin that populated those bloody torture chambers. Beziers was taken by men who had been promised by the pope that by engaging in the crusade against heretics, they would at death bypass purgatory and immediately enter Heaven. Sixty thousand, it is reported, in this city perished by the sword while blood flowed in the streets. At Lavaur, in 1211, the governor was hanged on a gibbet and his wife thrown into a well and crushed with stones. Four hundred people in this town were burned alive. The crusaders attended High Mass in the morning, then proceeded to take other towns of the area. In this siege, it is estimated that I00,000 Albigenses fell in one day. Their bodies were heaped together and burned. At the massacre of Merindol, five hundred women were locked in a barn which was set on fire. If any leaped from windows, they were received on the points of spears. Women were openly and pitifully violated. Children were murdered before their parents who were powerless to protect them. Some people were hurled from cliffs or stripped of clothing and dragged through the streets. Similar methods were used in the massacre of Orange in 1562. The Italian army was sent by Pope Pius IV and commanded to slay men, women, and children. The command was carried out with terrible cruelty, the people being exposed to shame and torture of every description. Ten thousand Huguenots (Protestants) were killed in the bloody massacre in Paris on "St. Bartholomew's Day," 1572. The French king went to Mass to return solemn thanks that so many heretics were slain. The papal court received the news with great rejoicing and Pope Gregory XIII, in grand procession, went to the Church of St. Louis to give thanks! He ordered the papal mint to make coins commemorating this event. The coins showed an angel with sword in one hand and a cross in the other, before whom a band of Huguenots, with horror on their faces, were fleeing. The words Ugonottorum Stranges, 1572 ("The slaughter of the Huguenots, 1572"), appeared on the coins. 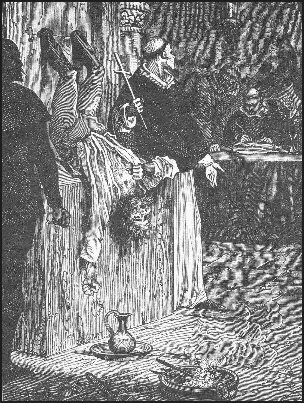 An adjoining illustration from Ridpath's History of the World shows the work of the Inquisition in Holland. A protestant man is hanging by his feet in stocks. The fire is heating a poker to brand him and blind his eyes. Some of the popes that today are acclaimed as "great" lived and thrived during those days. Why didn't they open the dungeon doors and quench the murderous fires that blackened the skies of Europe for centuries? If the selling of indulgences, or a superstitious worship of statues, or the immorality of some popes-if these can be explained as "abuses" or excused because they were done contrary to the official laws of the church, what can be said about the Inquisition? It cannot be explained away as easily, for the fact remains, the Inquisition was ordered by papal decree and confirmed by pope after pope! Can any believe that such actions were representative of Him who said to turn the cheek, to forgive our enemies, and to do good to them that despite-fully use us? Symbols of "Lucifer Sun Worship"